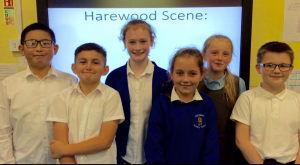 This term a group of talented Year 5 children will be bringing Harewood Scene to you. We hope you enjoy finding out more about the Harewood School Community. Take a look in the Gallery for lots more photographs by clicking here. 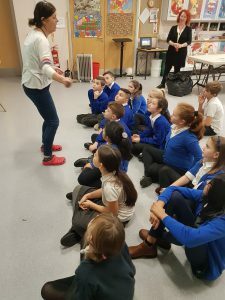 On Tuesday 26th March 2019, Set 1 book of the year people and book of the year club went to St Patrick’s Primary School to see the author that wrote Ice Garden called Guy Jones. The Ice Garden is the one in the Book of the year books. 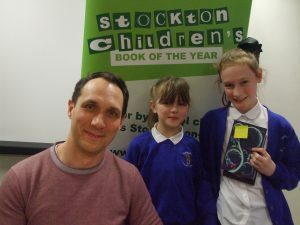 On 26th March two children from year 5 were chosen to go to Stockton’s Children’s Book of the Year. They got to meet four of the authors because one author couldn’t make it. The winner was Tom Nicoll who wrote Boyband of the Apocalypse. The children got a certificate each to say well done for getting picked, a badge and a book voucher to get a book. They had a lot of fun and got some books signed. 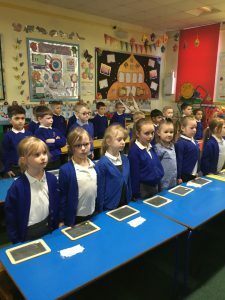 On the 21st of March year 1 had a Victorian day to experience what it was like back in the Victorian times. They found out what happened if you had been naughty, for example they were shown what would have happened if you got the cane punishment and they gave some of the children the dunce hat to wear. They also tried out a back straightener to help them set up straight and did some maths on the chalk board. Last week, year 1 went to Preston Park Museum for their history topic Victorians. Next week, they are going to have Victorian school day! They went to go and see what schools and homes were like back in those days. They used fountain pens and they learnt the punishments that happened almost 1000 years ago. They had a drink of hot chocolate in the Victorian cafe. 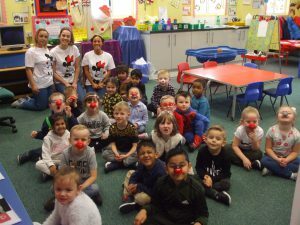 On Red Nose Day, all the classes did different activities such as: Year 2 and Year 4 designed red noses, Year 5 were doing red nose day colouring packs and bingo. Everyone came in non uniform and wore their red noses. In total our school have raised, for red nose day, £420. A very big thank you to everyone who brought in money. 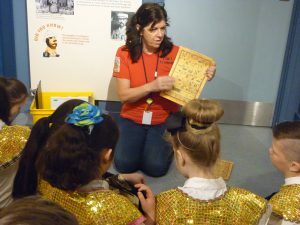 Y5 went on a trip to Dorman Museum on Tuesday the 12th March. It was all about Egypt. We went in two groups, one of the groups wrote their name in hieroglyphics, the other group were mummifying a fake body, they pulled out liver, lungs, stomach and intestines. At the end we switched and the other group did the same. Before we went we decorated a helmet. We had lots of fun! On the 7th of March everybody is invited to either dress in their pyjamas, school uniform or non-uniform or. Every child will get a £1 book token to use at most book shops to choose from 10 special different books that cost £1. 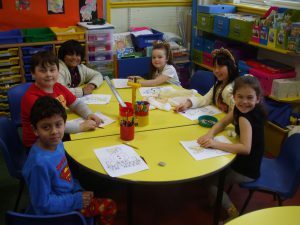 They will also do lots of different activities about world book day and hopefully the children will enjoy it. My Favorite book is Boyband of the Apocalypse written by Tom Nicole. 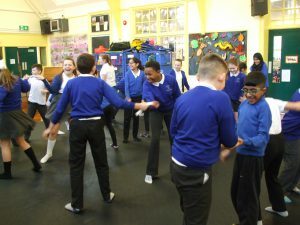 On 27th February, a man came to our school and taught children how to do Judo. They did activities, such as, knock each other off balance and they also played dodge ball, they had to be put in partners for this. Doing the judo helps them gain confidence in their control and partner work. On Monday 11th year 1 had a Katie Morag Day. They grew flowers and also made sheep out of cotton wool and paper plates. They tasted many different Scottish foods such as: haggis, salmon, shortbread, pancakes, iron bru, scotch broth and Scottish oatcakes. Year 1 also made porridgeies, did finger knitting and dressed up in Scottish clothing. They weaved paper to make tartan and did finger knitting to make some pretty bracelets. They had a great time! Year 4 went on a school trip to Durham Cathedral. They met a very kind lady who showed them around. They found out that Durham Cathedral was built between 1093 and 1133. 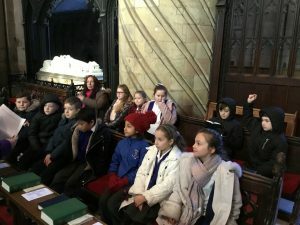 They had a great time learning about the History of the Cathedral. As they walked around, they saw a model of the Cathedral made out of 299,128 Lego pieces! There are lots of After School Clubs going on at Harewood. We have singing club, where they sing all types of songs! They sing a lot of Elvis Presley songs! They have Mr Gibson on the piano almost every song they sing and Ms Sheraton conducting them. A group of Year 6’s were selected to take part in the Makey Makey after school club. In the club the children have to make a circuit that is connected to the computer. The end of the alligator clips are connected to different things such as: Fruit, Jelly Babies and Tin Foil. They then used Scratch (a computer program) to create some code which runs their projects. 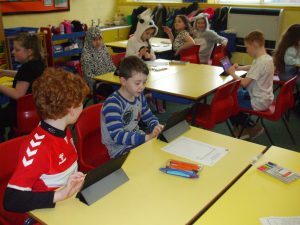 Year 3 & 4 go to an after school club where they can practice their times tables on TTRockstars. Year 3 are also running a drama club. For the beginning bit, a person stood at the front and asked a child to come forward. That child had to act like an animal while they moved towards the child at the front. Reception are running a games club where they learn to take turns and be patient, as well as learning how important it is to share. Year 4 are running a Juggling club. Mrs Burns is teaching the people in the club how to juggle. They use fabric at first and then go onto bean bags and then they make their own juggling balls out of balloons and rice. During Arts Week, Year 1 learnt about the polar regions and made things relating to that, for example they made penguins and polar bears. 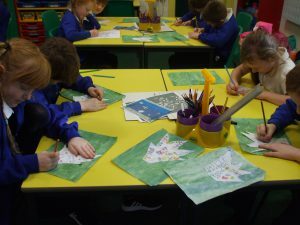 Year 2 learnt about the rainforest and did some art about it including sloths, tigers, monkeys and much, much more. 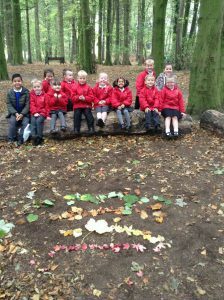 Year 3 were learning about the environment. Then they learned about how plastic pollutes the world. They made bottle fish, jellyfish and posters all about plastic pollution. They made a beautiful display with lots of ocean creatures. Year 4 made extinct animals! The topic was called The Lost Words because it was about extinct animals that we have lost in the past! It was also a poem book. Year 5 were doing about Trees. They were working hard to produce fabulous art that is now on display in our school hall. They used techniques such as: printing, painting and many more. They based their art off two artists, Eloise Renouf and David Hockney. Year 6 were learning about rock pools. During arts week they made fish, star fish, rocks and seaweed, they put it all together and made a fabulous display. On the 16th November children dressed up in fancy dress or their own clothes as part of Children in Need. Most children put a £1 donation in the pot and we raised a whopping amount of £435.00! A group of Year 5 children went to Dorman Museum. A lady told them facts about Mars. They made their own space helmets (out of a selection of material). They got put into teams and one team made rovers! Some year 5’s had to imagine that they only had 4 minutes of oxygen left and had to try to figure out a way to survive. They had lots of fun! 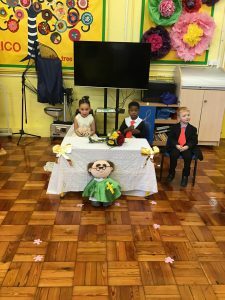 Reception held a fake wedding as part of their topic Celebrations. They made confetti and flowers to decorate the hall and they dressed up in costumes. It looks like they had a lot of fun. In Y3 a lady came in to teach them about the Stone Age. The children dressed up and learnt about the food that Stone Age people ate. They found it very exciting and interesting. 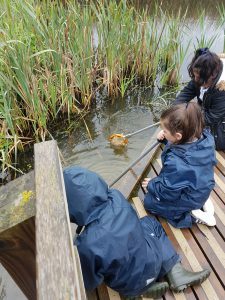 Last week Reception went on a trip to Hardwick Park. The guide talked to them about how to identify leaves. They made some collages with the leaves they collected. 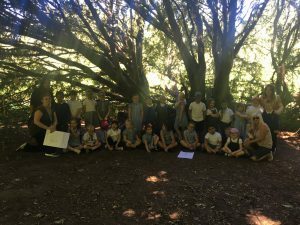 Last week year 4 went to Preston Park! They were researching the equipment for their DT topic all about play parks. With all the research they have done they will be making play park equipment out of straws, sticks and much more. Sports Day was amazing! Lots of the children’s families came to support and cheer us on. 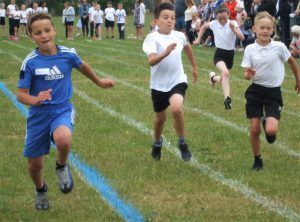 There were three races, running race, skipping race and an egg and spoon race. Well done to everyone who took part and an even better well done if you came 1st, 2nd or 3rd. Only three people didn’t hold their potato in the egg and spoon race! I think that everyone tried their hardest in every race.Thank you to all the teachers who made this happen! 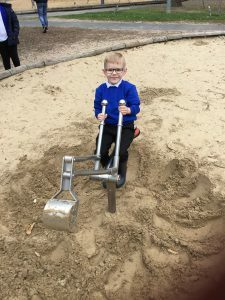 The Y1 children were invited to have a look around and partake in activities at the park. They first went and had a quick look around then were given a ball of very soft clay and were allowed to use mother natures resources to make a clay fairy tale creature! The children wrote a fairy tale story and looked at all the sculpture in the park.They also got to go to Rapunzel’s tower where she lay down to rest! The Year 2 children have been invited to partake in judo. They learned how to use judo properly and how judo is about co-coordinating the body and the mind. The sensei or trainer was called Phil, if the children enjoyed the session they could join his club. Y5 went to Dorman Museum for a trip. They wrapped a fake mummy called Edfu in bandages and said prayers. 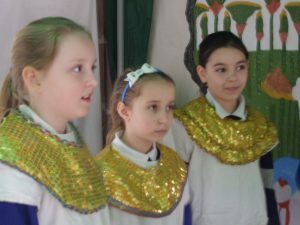 The children dressed up in Egyptian clothes and were introduced to the mummifying process that the Egyptians did. They were shown real Egyptian treasures. They even drew their name in hieroglyphs! Macey-Leigh is donating around 15 inches of her hair to give to charity! She is giving her hair to the Little Princess Trust. How brave and thoughtful is Macey-Leigh? The Little Princess Trust will make Macey’s hair into a wig for an unfortunate child who has lost their hair due to cancer treatment. Macey-Leigh is a shining star to our school for being so brave. Her hair will be cut in assembly in front of the whole school. Parents can also donate a small amount of money which will make a big difference to the charity and children with cancer. Finally, World Book Day is here! Harewood Primary are celebrating it and also doing lots of things such as; Non-Uniform/Dressing up as their favourite character, a book swap, design a bookmark competition and finally all the lessons are going to be based on books! Every child will receive a £1 World Book Day token that they can redeem at most bookshops for one of TEN special £1 World Book Day books. 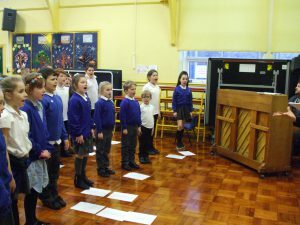 The whole of the school had a special visit last week. 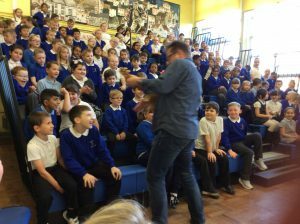 Paul Cookson, a famous poet came to Harewood Primary and read out some of his poems. He signed the all the books that the children bought. They had a jolly good time! He met lots of children and made them laugh a lot. All the children really enjoyed it. Hopefully he comes again. He was very funny and of course he made the teachers laugh as well. 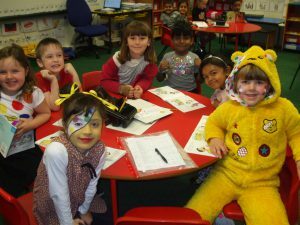 Our school raised the fantastic sum of £400 for Children in Need. Nearly everybody came in spots, including the teachers. As you can see the little ones enjoyed it just as much as everybody else. Thank you very much for your donations. 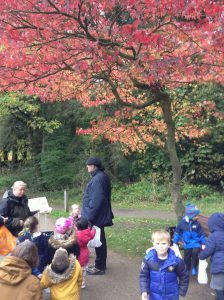 A group of children from Nursery went to Hardwick Park. 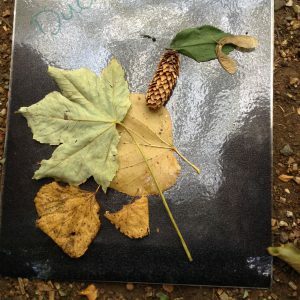 They did activities like collecting leaves and making pictures out of leaves and twigs. A lady told them how the leaves change colour during the seasons. The English teachers of year 4 and 5 took the top writers of year 4, 5 and 6. 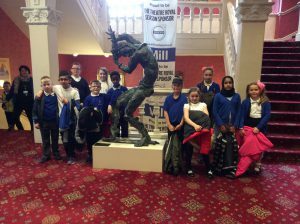 The children went on a trip to Newcastle to see Michael Rosen (author of We’re Going On A Bear Hunt) at the Theatre Royal. He was hilarious and the children had a fantastic time. Harewood Tots meet every Tuesday morning at 9:30 till 11:00. Harewood Tots meet at the Riverbank Children’s Centre in the crèche room. Children have to be between 2 and 2 ½ years old and have applied to join our nursery. Parents and carers stay with children. There is a baby area and an outdoor area. The children enjoy lots of activities including singing time, story time and playing with lots of lovely toys. 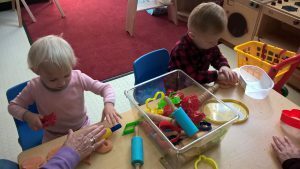 Children go to Harewood Tots until there is a place for them in nursery. A group of children went to Saltholme as part of their science project. They learned about different types of habitats. They also went pond dipping and learned about different bugs found in the area. Even though the weather was a bit gloomy they had an amazing time. 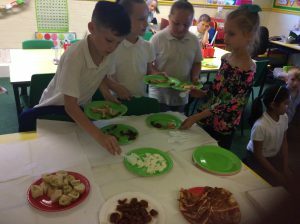 The Year 4 children enjoyed a delicious banquet as part of their geography studies about other countries. They tried lots of new food, some they liked and some they didn’t! 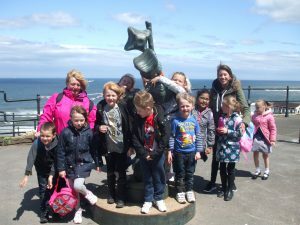 A group of Year 1 children went by train to Saltburn. They looked at the mosaics about the history of Saltburn. They went on the pier but it was very, very windy and they only got half way! The children built some super amazing sandcastles and played on the sand, then they ate lunch. After all that, they all went on a cliff lift and when they arrived at the top they had a choc ice. It was a long day full of fun! 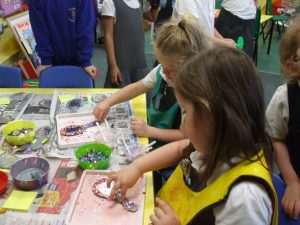 Harewood did art for Arts Week from the 5th to the 9th of June 2017. Year 6 created art based on The Rainforest, Year 5 the Great Fire of London, Year 4-Picasso, Year 3-Monet and Pop art, Year 2-Starry Night by Van Gogh and Andy Goldsworthy, Year 1-The books of Julia Donaldson and Reception-Princes and Princesses. It was quite fun but also messy and that’s what Arts Week is all about! 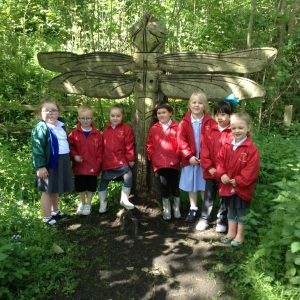 The children went to Guisborough Walkway on a hunt for clues to find the Gruffalo! They had to use a magnifying glass, a spinner and binoculars to hunt for clues. These led them to a mouse, an owl, a snake and eventually the Gruffalo. The saw wooden carvings of animals and even had time for a snack and a drink. They all had a lovely time. 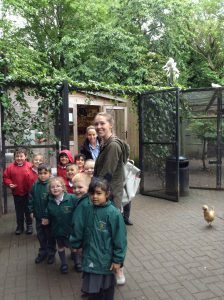 As part of their topic on animals the children went to the Owl Centre at Kirkleatham. They got to handle baby owls, snakes and rats. They toured the aviaries and saw lots of different birds. They had a fantastic time. 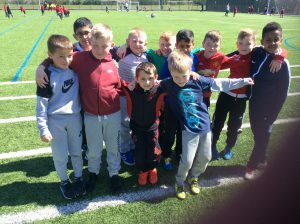 A group of children went to Northfield Academy to compete against teams from primary schools all over Stockton.They played four games and although they didn’t win they had a good time and showed very good sportsmanship. One of the children said they’re going to do a lot of practice before the next tournament. 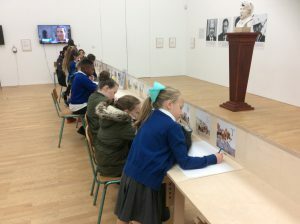 A group of year 4 children visit MIMA as part of their history topic. They looked at images of our local landmarks. They even learned about the colours used on the Transporter Bridge. They made some sketches of some of the art work in the museum. They created art which linked to discrimination. They learned a lot and enjoyed it. 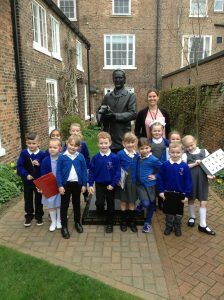 The children of Year 3 in Harewood visited the James Herriot Museum as part of their history and science lessons. They got to see lots of ways vets help look after all the animals. They also got to see the film set of the programme All Creatures Great and Small series. The children had a very lovely trip and learned so much about the life of a vet. It was a full day trip and they had lots and lots of fun! 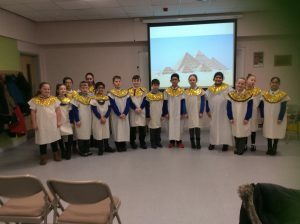 A group of year 5 children went to Dorman Museum to learn about their history topic, the Egyptians. 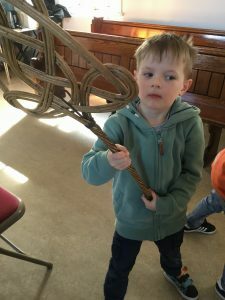 A lady told them all about the mummification system and hieroglyphics (the writing that the Egyptians used), the children also got to write their name in hieroglyphics. They saw some very interesting artefacts. The children and teachers got to dress up as Egyptians on the trip too. They made death masks and had a go at real mummification! The children got to pull the 4 organs (the lungs, the liver, the stomach and the intestines) out of a rich Egyptian but they did have to be careful not to pull out the heart. If they did the children were fired from their job! The children did get to know that a pharaoh, named Tutankhamun, was well-known because his tomb was never robbed by grave robbers. The children also found out that some pharaohs had their slaves die in the tomb with them and some even had their wives in the tomb too. The children learned a lot and really did enjoy visiting Dorman Museum. The whole of year 3 enjoyed a full day of Roman goodness. Some children dressed up as Roman people. On the afternoon they made wreaths out of bay leaves, Roman jewellery and head dresses. 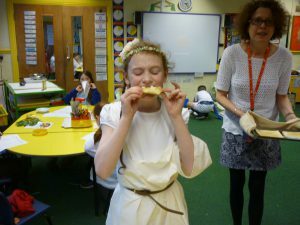 The children made Roman food such as pizza and cheese and honey sandwiches! They also drank grape juice! They had a marvellous time!